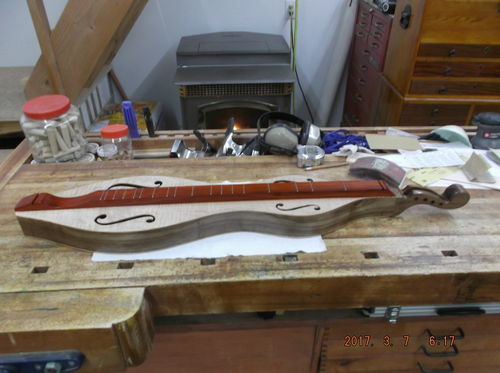 This mountain dulcimer build is entirely the fault of LJ’er Dave Rutan. 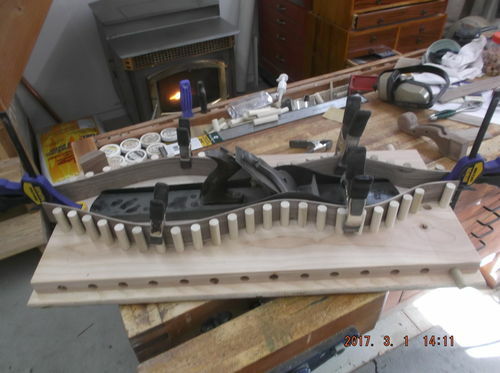 I followed his blog on building a mountain dulcimer while I was building a marimba. When I finished the marimba he had convinced me that I could build a dulcimer. Thank You Dave, I think. 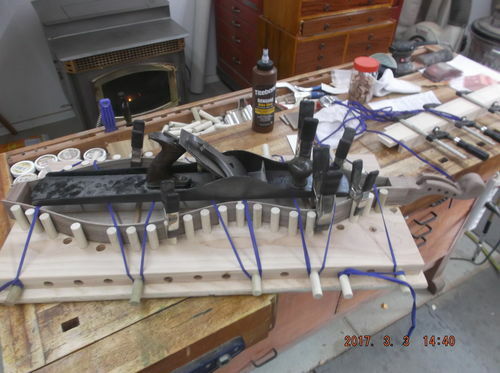 I started searching “building mountain dulcimer” after a week or two of reading. 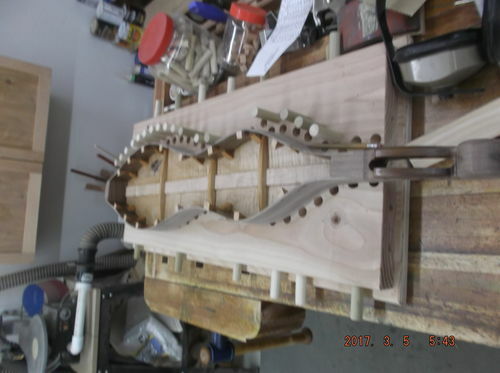 There are a lot of people building dulcimers as it is a folk instrument there really is no right or wrong way to build a dulcimer. It’s a dulcimer thing. 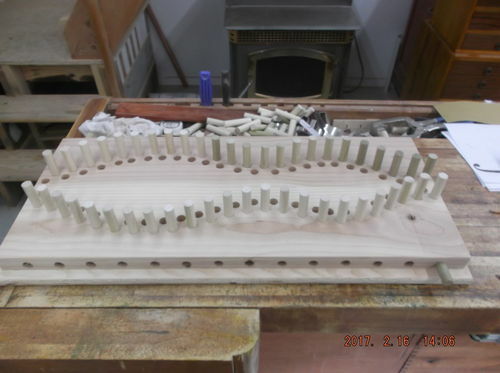 I decide to build a four string hourglass shape dulcimer. I ordered a paln from McSpadden Mountain Dulcimers. This gave me the shape and basic dimensions. I went to town. I decided to use traditional wood as much as possible. I had some fiddleback maple and walnut. I decided to do the front and back with the maple and the sides and scroll from the walnut. This was all resawed glued up and planed to 1/8”. I used a piece of padauk I had for the fret board while not a traditional wood. I found in my research that a lot of nontraditional woods were also use. It’s a dulcimer thing. I found a jig for bending and glueing on line that I liked so made one of those. I used 5/8 dowels when I build one for a different shape I will probably try 1/2” dowels. to get a template to mark the shape I went to Fedex Office and had a copy of that portion of the plan made and cut it out. That worked for both the jig and a template to cut the front and back from. Glued up and cut out the scroll head. Glueing the reninforcing strip down the middle of the back. That #8 works for more than just a plane. Glueing the side, head and tail in. Top and fretboard glued on. There are several calculators available for figuring fret spacing. I tried several and they all were within .0001 of each other. The tuners in the head. I finished this with several coats of shellac before installing the hardware. Next time if I use padauk I will finish the fretboard before glueing it to the top. I taped everything really well but still had a little bleed thru from the padauk. Here is the finished instrument all tuned and ready for my wife to learn how to play it. 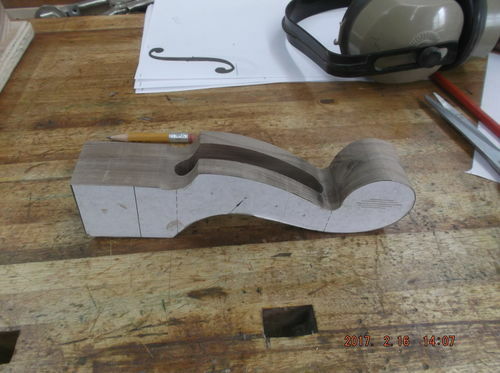 If you are interested in building stringed instruments. I would recommend a dulcimer as the first. They require a lot of the skills other stringed instrument require but are much more forgiving. I will build another one or two or three. It was a fun build. I learned some new skills and it didn’t take a lot of time. Most of the time wa waiting on glue to dry. Wow Bruce, what a beautiful instrument. Nobody would have guessed that this was your first attempt. Check out Matthias Wandel’s Big Print program. It allows you to print full sized patterns at home. 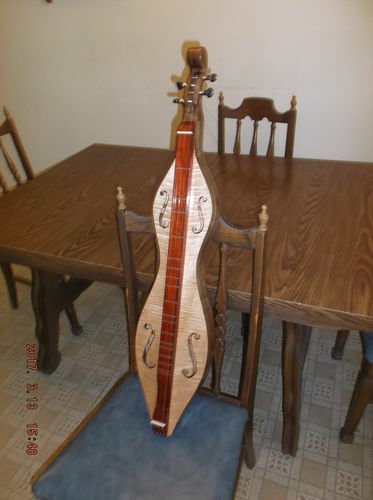 Bruce, this dulcimer is so beautiful and nicely done. Congratulations. It s a curly maple. Looks like a super fun project, wish I was musical. Very nice Job! 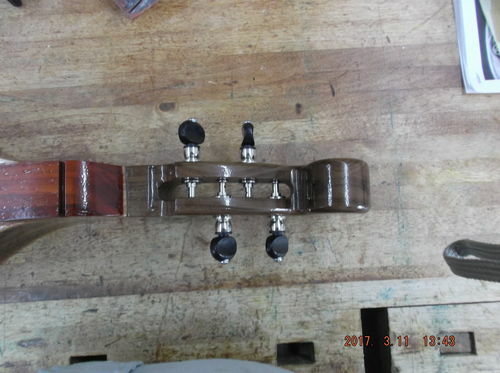 I really like the scroll work and the headstock. Looks like you went the extra yard with the tuners… nice touch. Now that’s a master craftsman at work…wow!!! Thats very good work Bruce. Not sure what Dave is up to I havent seen any posts for some time, he is possibly flat out repairing instruments I guess.